This guide teaches readers virtually everything they need to know about making it through even the worst water crisis imaginable. Survive Water Crisis, the latest guide created by emergency preparedness expert Damian Campbell that teaches readers how they can survive a water disaster by purifying, storing, and recycling the right amount of water while spending as little money as possible has caught the attention of Shane Michaels, prompting an investigative review. The average American uses about 150 gallons of water per day for everyday tasks and activities. In comparison, the natural water resources available in China only allow for each person on average to have about 7 gallons of water per day. Because the U.S. has such an abundance of natural water resources, the likelihood of China demanding water exports by the U.S. in the form of debt repayment is extremely high. In the Survive Water Crisis guide, Damian Campbell outlines the most practical and affordable ways to purify, store, and recycle water when a shortage of readily available water occurs in the U.S. infrastructure. In the guide, Damian Campbell outlines several different methods of water conservation and recycling in order to diversify in the case of various scenarios. His guide also outlines how one can survive the first three days of a water disaster even if they haven’t had a chance to prepare for it. It presents many examples of worst-case disasters so readers are prepared to know how to react in the event of a variety of different scenarios. In addition to the guide itself, each purchase of the Survive Water Crisis guide comes with bonus offers that helps customers make the most of the information they receive from the guide. 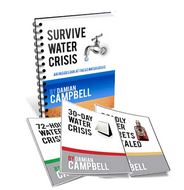 Currently, the Survive Water Crisis guide and bonus offer is available for one low price of $27. Those wishing to purchase the Survive Water Crisis guide or for more information, click here. To access a comprehensive Survive Water Crisis review, visit this site.